Colonia, Yap – Each passing day in the Micro Games seems to end in a handful of more medals for Guam’s dominant Track and Field team. The runners added eight more medals, six gold and two silver, during Wednesday evenings meet. 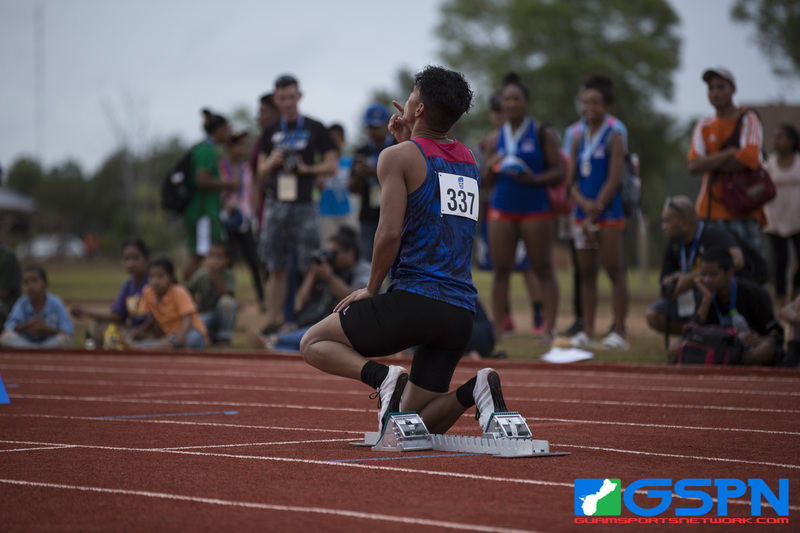 The most emotional event came from Guam’s Jeofry Limtiaco, who poured in an impressive final 100m to fend off Pohnpei’s runner to secure gold. With the Guam team cheering on from the finish line and the men’s basketball team roaring cheers from the finish line, Limtiaco was overcome with emotion after hitting his best time in the Micro Games to date. The ‘G’ in Genina Criss stands for ‘gold’ as Criss has now come on top of every event she’s competed in so far, which includes the 10,000m, 5000m and now 800m distances. Richele Tugade has been making her own waves on Yap’s tracks as she triple jumped and hurdled her way to two more gold medals. Guam’s Olympian Josh Ilustre dominated in the 800m event and teammate Darin Pascua put together a final push in the last 100m to secure Guam a silver medal. Guam’s ladies set a new standard in the relay by breaking the Micro Games record with a 50.97 time. Perfect hand offs at the start from Packbier to Tugade, and Tugade to Amparo, resulted in a flourishing final 100m for Shania Bulala.